With this page we are introduced to Lisle, The Mark’s future love interest. Initially, I based her off of Ingrid Bergman. In any case, as I completed pencils on issue #2 I had the inspiration to go in a more Ruebenesque direction with Lisle’s design. I asked my editor, Bob Schreck, and the writer, Mike Barr, for their approval, and they acceded to my desire. I’ve included the before and after versions. My motive for making this casting decision was, I wanted to be PC. Through my husband, John Callahan, I was friends with several Lesbians of Size, and it struck me as unfair that they should be unrepresented in the media. Then I had to figure out how to draw obese-yet-attractive women; I rented a couple Rosanne Barr movies and sketched her off of them, and I found of a copy of “The Honeymoon Killers” and sketched the movie’s star, Shirley Stoller. Following Mike Barr’s advice, I went to the local newsstand and found copies of fashion magazines for women of size (I don’t recall their names). Looking at the results today, I think I erred on the side of realism. You can judge for yourself over the ensuing days. 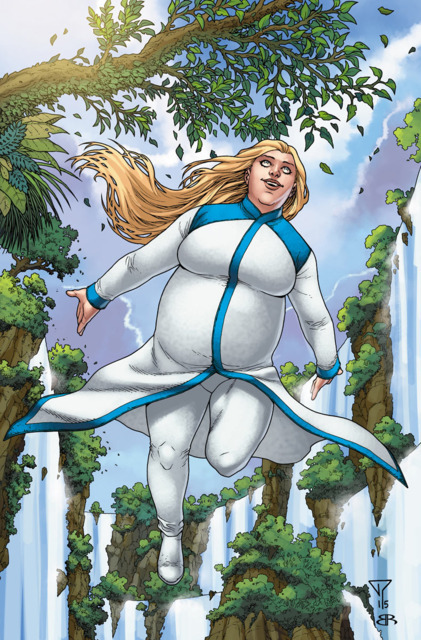 Interestingly, Valiant Comics is mining the same lode with their “Zephyr” character. I’m also including the page as colored (by John A. Wilcox). I was extremely unhappy with the published work; most of my friends had no idea what bothered me about it. One observation was that the colors were “pretty”. Perhaps, but they didn’t tell the story. The colorist seemed to have no concept of value or how to direct the eye with contrast. 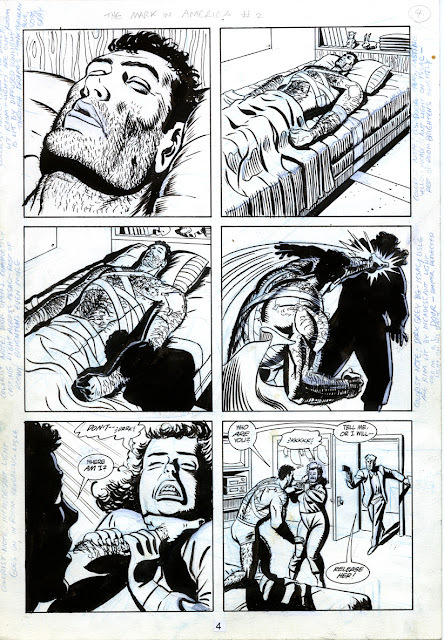 This page is a good example of my point. 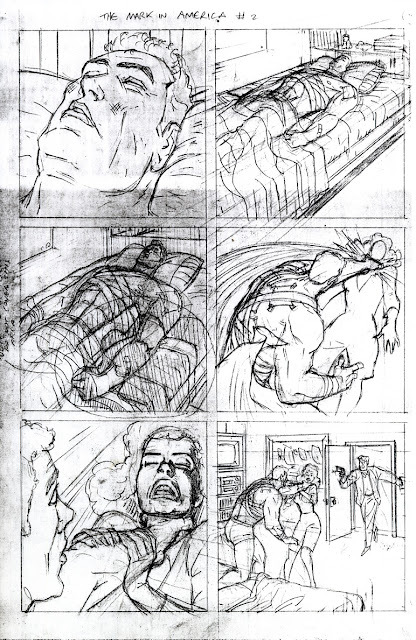 This is page 4 for "The Mark" issue 2, volume 2, otherwise known as "The Mark In America", published by Dark Horse Comics in January 1994. Written by Mike Barr, drawn by Brad Rader.